← Shopping on a Budget, Birthday Month Style! I’m not an overly girly girl. I grew up as a total tomboy! I rarely wore dresses unless forced to and in undergrad I finally started to enjoy wearing them! The only girly thing I’ve always enjoyed is a manicure and a pedicure! Since I’m a total klutz I always mess up a manicure right away, or at least within the first couple days. As a broke grad student, it just became not worth the money when I couldn’t keep the polish pretty for very long. Then I made an AMAZING discovery!! OPI gel polish! It lasts on your fingers for about 3 weeks and on your toes 6-8 weeks. 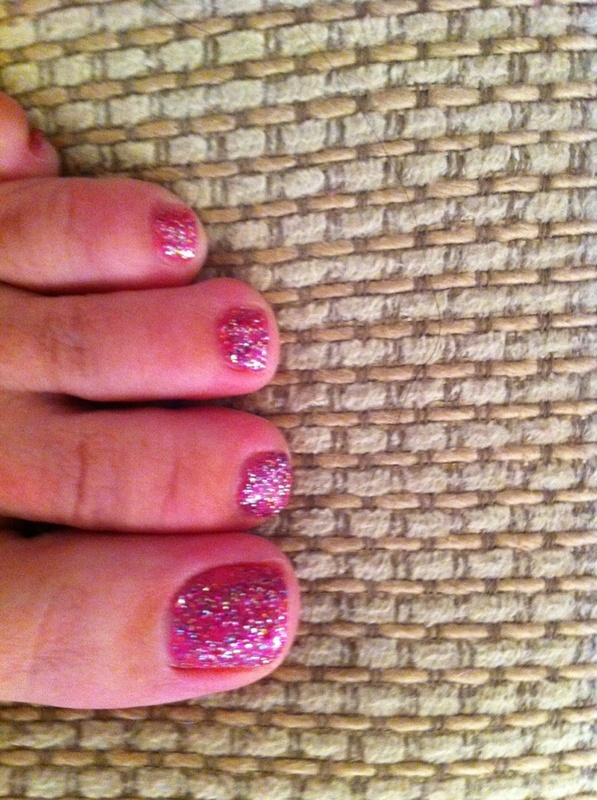 The OPI gel polish comes in soooo many fun colors and lots of glitter! I seem to be on a glitter kick, I LOVE IT! I’ve had two gel pedicures. The first one lasted two months, and the polish still looked perfect, but the nails can’t be cut with the gel polish on and after two months, no matter how lazy you are, it’s time to get the toe nails cut! The picture to the left is of my current pedicure, it’s been on for three weeks and i LOVE it! it’s a base coat of the strawberry margarita color with a purple and pink glitter on top! It costs an extra $20 to get the gel polish and it last so long it’s totally worth the money! I just got my first gel manicure a week ago. I needed the polish to last and not get messed up through packing for my trip and traveling across the country. I was in a wedding, so I needed my manicure to look good! It’s been a week and my nails are still PERFECT! And they dry instantly! As soon as I left the salon I was able to do whatever I want without fear of messing up my nails. I packed for a trip, cleaned my apartment and did 5 loads of laundry and still have perfect nail. Gel polish is perfect for any lazy girl! Since Gel Polish is expensive, I do have an alternative for those who are lazy and broke. Sally Hansen Salon Effects also last pretty well. They are a nail polish sticker. I have used four different patterns and the shortest was 10 days, the longest was 14 days. They don’t last nearly as long as gel polish and they chip easily, but they come in prints that are more fun than regular polish! They take about 20-30 minutes to apply. The more you use them, the faster you are at applying them. I’ve actually applied them during a class (oooppppppsssss don’t tell my prof). They require a little bit of effort for a lazy girl, but it’s well worth it! Pick a color you really like with the gel polish, it’s gonna last a while so you better like it! Not all salons offer the gel polish, so check with the salon before you go. It costs an extra $20 (at most salons) to get the gel polish, so keep that in mind when budgeting for a manicure! Go see my girl, Anna, at VIP Nails at Russell and Grand Canyon. She’s the BEST! and has no idea I’m blogging about this! You can pick up Sally Hansen Salon Effects at Walgreens, CVS, Smith’s, Wal-mart, Target, Ulta and pretty much everywhere else that sells Sally Hansen Products. Hi Marykate! Thanks! I checked out your blog, very nice! I may need some design tips from you!